BOGO – buy one, give one! If you offer a physical product, consider donating products organizations that may need them. Think of the TOMS Shoes model – for every pair of shoes sold, they donate a pair of shoes to someone in need. 2 million children have been protected from hookworm with medication and TOMS Shoes provided by their Giving Partners. TOMS has become synonymous with this buy one, give one structure and is a hugely profitable company that started out with giving in mind. This philosophy can be easily translated to many different product types – just keep in mind your margins so you can remain profitable while philanthropical. If you need to adjust one-for-one to a structure that donates one after ‘X’ amount of sales then do so – some is better than none! Select a charity & donate a portion of your proceeds to this organization. This one might seem obvious, but consider how the organization you choose relates to the product or service you offer. If you’re a stationery designer, how about an organization that helps provide school supplies? If you’re in the wedding or event industry, how about an organization that provides celebrations to children in need, like The Birthday Party Project? Every little bit counts & remember to share your organization with your customers. They’ll want to hear about the amazing causes their buying power is supporting. If you run a service based business or offer a skill that you can teach others, consider offering an e-course with all proceeds going to the cause of your choice. This accomplishes two things: giving to those in need & promoting your business and specialization. It establishes you as an expert and involves your customers and community in the act of giving back. The Rising Tide recently offered an online summit to benefit Pencils of Promise. They raised over $65,000 to build a school in the developing world. Pretty amazing, right? This is a large scale example for an online webinar, but even if you start small you’ll be making a difference! I hope this has provided you a few ideas & maybe inspired you a bit! Stay tuned to the blog for a future post on how to record & write off charitable donations. Tell us: what is a charitable organization that is close to your heart? 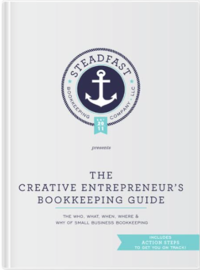 « Get to Know the Steadfast Bookkeepers!